Includes Weatherproof Double Gang Surface Mount Outdoor Box with multiple entries for conduit or wires. You can also Flush Mount it in a Double Gang Masonry Box (that type of box is needed so the screws line up wit the faceplate). 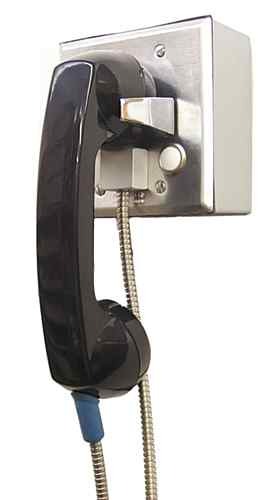 This works great when you need privacy like in a lobby, or where it's noisy like at a trucking company or airport gate. Only 2 Wires to connect it! Includes push button for CALL button. If used in a very noisy area, add our Noise Cancelling Transmitter. ​NOTE: Electronic Devices Attached to Phone Lines Need Lightning Protection! If the Door Box System is attached to a phone line in a home, it can be damaged during a lightning storm. The Phone Company provides lightning protection where their wires enter a home, but it's designed to prevent damage to the old style phones that weren't electronic. Modern electronic phones or phone equipment is much more sensitive to lightning than older phones. If your Door Box is mounted to the side of the building, and the wires don't travel outside the building, you don't need lightning protection on the wire coming from the door. If the Door Box is located at a gate, away from the building, you absolutely need lightning protection on the pair of wires before it gets to the Controller. Even if you run the cable to the gate in a metal conduit, you still need lightning protection on the pair from the door, at the controller. Be Sure to Check Out Our Lighting Protection! You need our MLP-270M or MLP270T for the phone line, and the MLP-030T and Door Box TVS for each Door Box where the wires go outside the building.